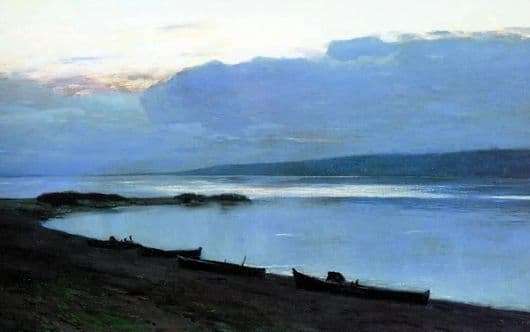 Levitan’s painting “Evening on the Volga” catches the eye with its brevity. Early summer sunset – the sun is overcast, but still light. Twilight is approaching. The vast expanse of the river smooth surface – a little distant Volga merges with the sky on the horizon line. It seems that the water surface in front – is infinite. The picture is very voluminous and striking in its realism. The view of the majestic river creates the feeling that the viewer is on the banks of the Volga. In the foreground is a sloping shore, covered with sparse, but very bright grass. There are several old wooden fishing boats on the shore almost at the water’s edge. There are no people around them. The coast extends far into the picture. It seems that the river is boundless, it goes somewhere beyond the edges of the canvas. Externally, the landscape is very calm. But the chilly-blue shades prevailing on the canvas, evoke tension and sadness. The picture is completely static – no wind, no river ripples can be seen, the surface of the water is like a mirror. The evening is gathering. The spectator will surely feel the coolness of the evening on the bank of the river, the freshness and smell of mud coming from the water. Goosebumps will run over your skin as if your shoulders were chilly. The sky is very low, it seems the clouds will touch the water. The clouds are dark, almost covering the sun has already rolled. But its light still makes its way beyond the clouds before disappearing beyond the horizon. In the background you can see the coast, it is completely covered with shadow, twilight has already fallen to the far coast. The picture “Evening on the Volga” carries a deep philosophical sound. The depth of experiences, a reflection of loneliness and tension fill the picture. However, the viewer would like to be on the other side, sit on the ground, think about the deep, looking only into the distance – where the sky connects with the river, where the sun goes down beyond the horizon, slowly feeling the approaching darkness of the night.